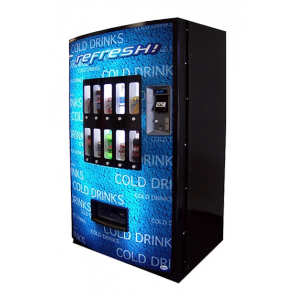 With the Vendo 621 Live Display Soda Machine you can vend 8 differently priced items ranging from 12oz cans to 24oz bottles. This Soda machine does not use flavor strips. You place the product in the display window in the door. No flavor strips to keep track of. This Live Display Soda Machine has a small footprint but a very high capacity. Vendo 621 live display soda machine is a treat to watch! Ranging from 12oz cans to 24 oz bottles, Vendo 621 beverage vending machine allows you to vend 8 differently prized items at a time. 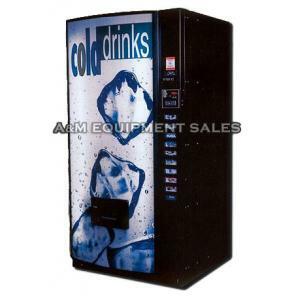 To call Vendo 621 one of the best selling bottle-can drink machines of the present times wouldn’t at all be a mistake. 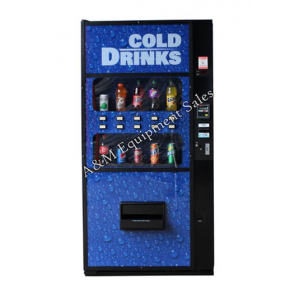 With one of these live display vending machines at your place, you can make the best impression on your neighbors and also on your clients who would not stop arriving, admiring and asking you for one more. The best part about this Vendo 621 live display soda machine is that it could be as easily fitted in outdoor settings as it’s done inside. You can easily find one of these Vendo 621 live display soda machines in the cherished possession of all the passionate bottlers. Available only at $2945, Vendo 621 is gold. A great vending machine for small to medium size locations. (72″h x 32.5″w x 31.5″d). Shipping weight approx. 730 lb. 24 volt, DC motors with no micro switches, no timing cams, and the motors are installed with only two screws. Fast and easy. Flexible-Shimless vending of bottles, cans, cartons, provides optimal product mix and maximum vending profits. Very easy to change settings from bottles to cans simply move the back spacer , adjust the product slide and select the appropriate depth setting. We are an authorized distributor for this machine. Parts warranty: 6 years refrigeration unit, 5 years electronic controller, LEDs, and vend motors, 2 years on new changer and validator. Shipping not included. 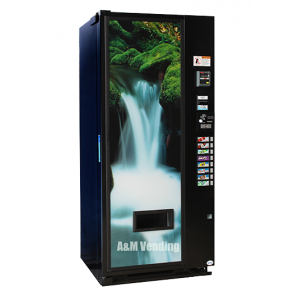 Machines that pair well with the Vendo 621 include the AMS Snack Machine and the AP Snack Machine.